"Thankful For Nature" Board Book that I created with "Happy Camper"
Both of the collections are filled with the cutest critters, so I wanted to showcase them in the form of a board book! I started with a couple of 4.5"X5.5" dies by Top Dog Dies and sheets of heavyweight chipboard. I cut the base pages from 12X12 papers and the oval inset was cut from 6X6 papers...I love the mix of larger prints with the smaller ones! I'ved added some of the new glittered enamel dots, but if you're making the book for a smaller child, you may want to try hand-tied buttons or brads instead. Doodle Pops and stickers layered on with foam adhesive add interest, as well as dimension! Thanks for joining me today at Doodlebug Design! This is so cute Shellye!!!! OMG!! This little book is precious!! Super sweet book! I love how each page is a little different, but they all have the wonderful stitching! Thanks so much for sharing! 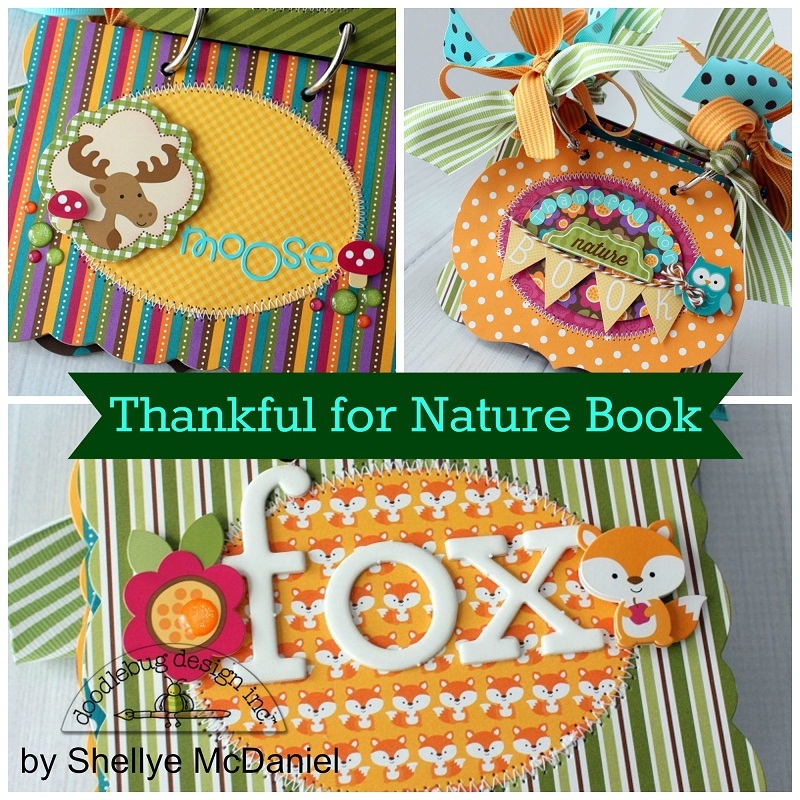 SUPER CUTE nature book Shellye - LOVE IT ALL!!! I gushed all over this at Shellye's blog!! Such an amazing creation!! Made possible with Doodlebug's amazing products! !